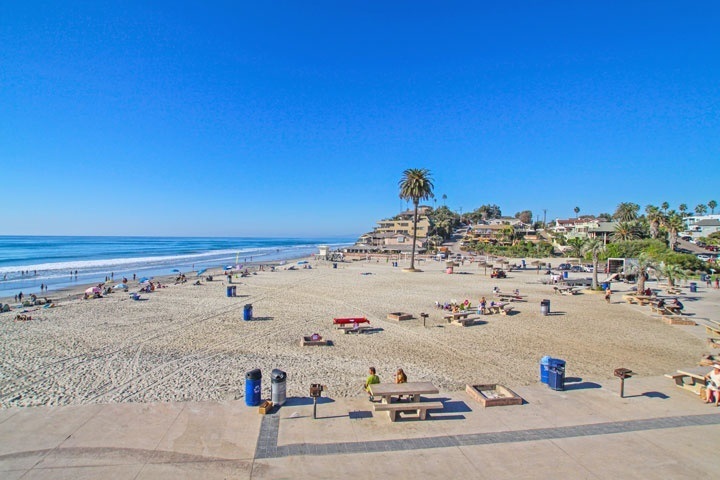 Encinitas is made up of both beach front and an inland community beyond Interstate 5. Running parallel to historic Highway 101, the beaches of Encinitas are some of the best known. The terrain ranges from which sand beaches to rocky bluffs and legendary surf spots line the coast. An eclectic mix of ‘60s inspired beach culture combined with boutique shopping, contemporary restaurants, new age meditation gardens and yoga studios, Encinitas is a vibrant and authentic beach town where the local surf scene rules, vintage cars take to the streets, and hipsters reside. Its famous beaches include Moonlight State Beach, Boneyards, Swami’s and Sea Cliff. Also known as Flower Capital of the World due to its unique nurseries, gardens and San Diego Botanic Garden. Numerous restaurants (all wonderful)—find the best margarita in Southern California and the historic Santa Fe Railroad Station of 1888. Leucadia is a beach community located in the coastal city of Encinitas. The relatively secluded beaches of Leucadia lend it a prominence in Southern California surf culture and is recognized globally as one of the most quintessential surf towns. The beaches of Leucadia are all located below steep vertical cliffs, with three main stairways that lead down to sandy shores and great surf spots. They can be difficult to find, which makes Leucadia one of the more secluded beaches in the area and a popular choice among locals. The community has made a concerted effort to “keep Leucadia funky,” which shows in shops and restaurants along the main thoroughfare historic coast Highway 101. Population of Encinitas is approximately 62,700. Average Income is estimate at $123,180. Average price of a detached home is $2,041,517.